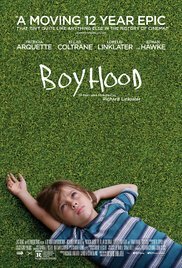 Filmed over 12 years with the same cast,Richard Linklater’s BOYHOOD is a groundbreaking story of growing up as seen through the eyes of a child named Mason, who literally grows up on screen before our eyes. The film charts the rocky terrain of childhood like no other film has before. Snapshots of adolescence from road trips and family dinners to birthdays and graduations and all the moments in between become transcendent, set to a soundtrack spanning the years from Coldplay’s Yellow to Arcade Fire’s Deep Blue. It’s both a nostalgic time capsule of the recent past and an ode to growing up and parenting. As a concept movie, “Boyhood” definitely can be called a successful experiment. It took Richard Linklater no less than 12 years to realize this film. It’s a registration of the daily life of an average American family with characters interpreted by the same actors or actresses in different life cycles. Is this an unique concept ? Unfortunately not. In 2001, the Harry Potter saga started with the main characters growing up while the story progressed. So that gimmick is already used. I’m also the proud owner of a whole collection of home videos I made for years with my Sony Handycam. Would the result be similar to “Boyhood” if I’d edit these nostalgic film clips into a motion picture ? No of course not, because my creation wouldn’t be right. The synchronization between the different periods would be wrong. The themes wouldn’t be in harmony. The continuity wouldn’t be guaranteed, especially regarding the overall atmosphere. In terms of content, there might be similarities, but ultimately it simply will become a banal family documentary, dominated by triviality and platitude. What I’m trying to say is that probably there will be some who’ll portray “Boyhood” as an extra-long home video, while for me it’s not so evident to come to this result. Ingenious and phenomenal at the same time. Don’t expect truly earth shaking events or developments. You only witness the calmly on-going life of Mason (Ellar Coltrane). A life as most of us have experienced it. A life full of ups and downs, with its euphoric moments and sad moments. A life that forms you as a human being into the personality you’ll finally become when reaching adulthood. Also Mason goes through all these stages : first a carefree teenager, school troubles, domestic problems, puberty, an exceptional father who occasionally crosses (during major and minor moments) his life, teenage love, his heart being broken and than the final step to adulthood. 12 Years interwoven with no visible indication in what time span it’s happening at that time and this summarized in 165 minutes. Together with his sister Samantha (Lorelei Linklater), daughter of Richard Linklater and a teenager with an attitude, and his mother (Patricia Arquette), who won a gold medal in the Olympic discipline “choosing the wrong guys”, a touching coming-of-age story unfolds itself. Afterwards you realize how volatile time is and how our life goes on with an irreversible pace. Ellar Coltrane plays literally and figuratively the role of his life. The beginning was a little bit sluggish and lethargic. It seemed to leave him indifferent which made him act quite apathetic. But as he grows older, I appreciated his deep philosophical musings more and more. His argumentation while driving on the highway about humanity functioning in modern society as self-healing and reproducing robots, because the manufacturing of cyborgs would be too costly, I found funny but at the same time I realized that it was uncannily accurate and that there’s actually a little truth in what he claims. Again something I could identify myself with. Lorelei Linklater grows into a rebellious and wayward teenager. Arquette’s roundings expand as the years pass. The only one whose looks remain timeless, is that of Ethan Hawke. Although it feels as if he plays an ancillary character who pops up occasionally into the life of Mason, I found this the most beautiful role in “Boyhood” and for me the one who exerts the most influence on the development of the person Mason. A brilliant interpretation: serene, vulnerable and supportive. And maybe it’s my imagination, but I thought Mason resembled more and more Hawke as he grows older. What a coincidence. The final conclusion is that it’s a brilliant concept with delightful characters who grow and unfold themselves as time progresses. So what’s wrong with it than ? Absolutely nothing, except in the end it’s just a dull affair. You can’t say there are many startling things happening. Despite the chaotic periods Mason’s mother is going through , you can’t detect any real traumatic experiences. Every average family’s life looks like this. And yet this film is praised to the skies. And that’s because everyone sees something in it they can relate to and finally think something like “Hey, I also experienced it like that” or “Damn that happened to me also in that period”. And that’s the strength of “Boyhood“. A mirror is held up in front of you and you’ll come to one conclusion : Life is a concatenation of moments you need to enjoy fully, because there comes a time you’ll realize that those moments have passed. And that’s perfectly summarized by Mason’s final sentence: “It’s the constant moments, it’s just … it’s like always right now“. Should have won the Oscar.